Exeter Cub Scout Pack 218 joined Exeter Boy Scout Troop 218 and all of their parents to carol at Fairview Manor in Fairmont. 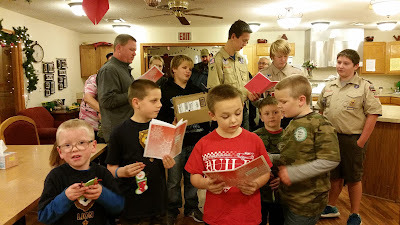 The Cub Scouts passed out decorations they had made for the residents. The Boy Scouts also caroled at Heritage Crossings in Geneva. Pictured in the front from the left are Axel Erdkamp, Crosby Oldehoeft, Richard Hickman, Levi Jurgensen, Deacon Erdkamp. Behind from the left are Will Yokel, Mikey Bartu, Clint Oldehoeft, Braden Capek, and Tyler Sysel.